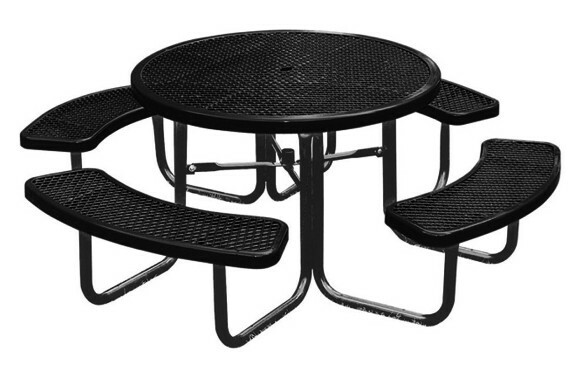 The 46" Round Expanded Metal Picnic Table is a fantastic, long-lasting site furnishing for your park or playground. Constructed from 2-3/8" outside diameter galvanized steel pipe, with an all MIG-welded frame, and 1-1/16" outside diameter braces, it is assembled via all stainless steel hardware. It also boasts a powder-coated frame, and thermoplastic coated expanded metal (diamond patterned) bench seat and table top surface for superior comfort, impact resistance, and UV stability. With eight thermoplastic color options, it will to match whatever commercial playground equipment you have.